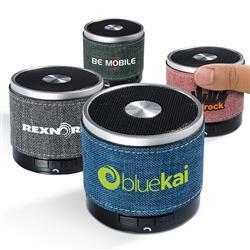 Our on trend Strand™ Bluetooth® Speaker is palm sized with snow canvas accent wrap body and no slip bottom! 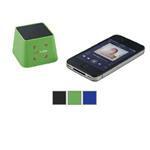 Pair with your smartphone to use hands-free microphone feature and push button to answer calls! 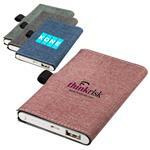 Connects to your mobile device using wireless Bluetooth® technology or through the 3.5mm audio cable (not provided) Also play MP3 files though a USB flash drive or TF card. 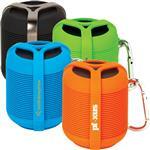 Our Strand Bluetooth Speaker is CE and FCC approved and is a great fun size tech promo item!